For a quick exercise that can be done at the home or gym without taking up a lot of space, consider trying a dumbbell squat clean. Squatting clean can give your muscles an extra workout while the dumbbells take up very little room in your home or gym. Squatting is one of the most difficult and one of the most productive strength training exercises available. The force required to squat will quickly produce results, building muscles in your legs, shoulders and back much faster than other exercises aimed at the same muscle groups. There are various methods to squatting. It is possible to squat from a chair or seated position, with a ball behind your back at a wall, or to power squat and receive the weights while standing in an upright position. One of the most intensive squats is the squat clean. To squat clean, you must take the weights in a starting position that leaves your bottom below your knees. This is a full squat position; from this position you will lift straight up, unbending your legs completely. To do the next rep, you will return to the full squat position. Squatting clean can be more difficult than power squatting or chair squatting, which will work your muscles harder, giving you a better workout with fewer repetitions. When working out with dumbbells, it may be easier to squat clean, picking the dumbbells up off the floor when you are in the full squat, rather than having the weights lowered onto you. Some people may find that squatting with dumbbells is easier than a bar. 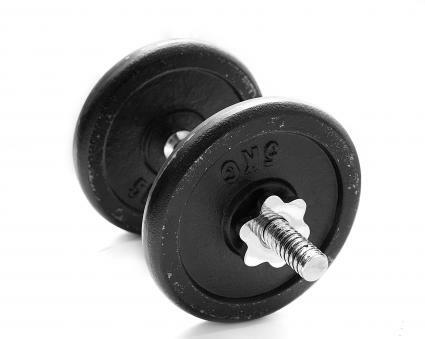 Dumbbells take up little room and don't require a special handling system to deliver the weight to your back. You also have the option of positioning the dumbbells at your shoulders or holding them with your arms loose at your sides, whichever option feels for comfortable for you. Place the dumbbells on the floor on either side of you, in reach, with room for your feet to be a shoulder width apart. Place your feet at a 45 degree angle, facing outward for better balance. Bend your knees and lower your bottom until it touches the backs of your feet. Your knees should be higher than your bottom. Take hold of the dumbbells in each hand. You can raise them up to your shoulders or keep your arms loose with a firm grip on each weight. Raise your chin and push your chest out so your spine takes a very slight curve in your lower back. Push yourself into a standing position from the true squat, taking the dumbbells with you. Drive your weight down into your heels; do not rock forward onto your toes. Do not lock your knees at the highest point; keep them very slightly bent. Pause for a moment at the highest position and slowly lower yourself back into the true squat position, taking the weights with you. Do not pause in the squat position; as soon as you return to the clean squat, immediately drive upward again. Repeat until fatigue or until you can no longer complete the squats accurately with good form. As with any exercise, use only as much weight as you can handle while executing the squat with good form. Begin with fewer sets or reps, or lower weights and slowly work up each week. Some experts recommend doing reps of 20 clean squats in a set while others prefer five to seven reps. Always work in your comfort zone to avoid injury. Performing a dumbbell squat clean in good form will help you achieve the results you want without the need for large machines or equipment. Practice squatting clean every time and know you're getting the best workout you can.